Joe Scarpa never planned on sticking around the rough Depression-era Philadelphia streets where he was born. Because how much fun is it stealing apples from blind men and slathering them in Cheez-Whiz? He headed south as a teenager and spent decades navigating the murky waters of regional wrestling leagues under various names, but didn’t get his first big break until 1973, when he donned some Native American drag and showed up at that year’s Oscars to collect Marlon Brando’s statuette for The Godfather. Well, actually he rejected the award on Marlon’s behalf and gave a 25 minute speech on why it was wrong to litter. Then he shed a single tear that remains an iconic American image to this day. A young Vince McMahon saw the genius there, and brought him aboard the good ship WWF. 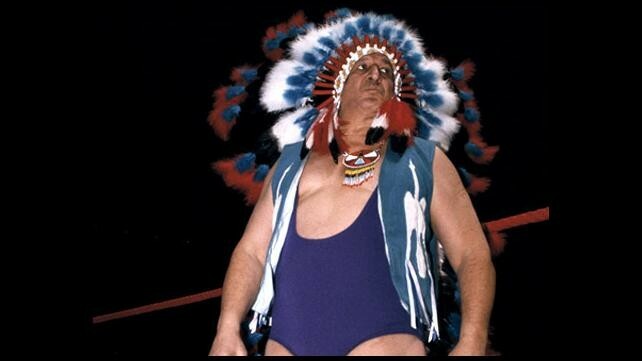 Sacheen Littlefeather was never seen again and a man named Chief Jay Strongbow emerged as an instant fan favorite in a wrestling league that was about to take over the entire industry. A fascinating background for sure, but let’s not forget the reason Chief Jay eventually received an obit in the New York Times. He simply had one of the coolest dances in history and I don’t mean just wrestling history but pop culture history. You can keep your Disco Duck and Macarena, I’ll take Strongbow’s War Dance any day of the week including Sunday. You can batter him, kick him, flip him over the ropes onto the concrete, but once those buckskin-clad feet started shuffling and those shoulders started rocking back and forth, every person watching knew the tide had turned. Tomahawk Chops would start flying in and then an expert application of the Sleeper Hold would leave his opponent crumpled on the canvas like, well, like a sack of stolen apples covered in Cheez-Whiz. By the time I started watching him, the guy was already 54 years old. That’s a dedication and a commitment to craft anyone would be proud of. Did I mention he got an obit in the New York Times?? Junkyard Dog and Big John Studd were lucky to get two sentences over the AP wire.